Gaming Club Casino has packaged its services in such an immaculate manner that it does not need large bonuses to attract new players. Its name alone is a brand that Kiwi players know of and trust. Since founded in 1994, Gaming Club has curated a gaming experience that is only rivalled by a few. We recognised its longevity in the online casino gaming space and visited the gambling site to conduct a review. Find out why it is one of the most trusted online casinos in New Zealand. Our Gaming Club online casino review gives insight into over 600+ games available at the casino plus the bonuses offered. Why Play at Gaming Club for Real Money? Kiwi players looking for a premier internet gambling site should sign up with Gaming Club Casino NZ. While the sign-up bonus is rather modest, players will definitely get their value’s worth. 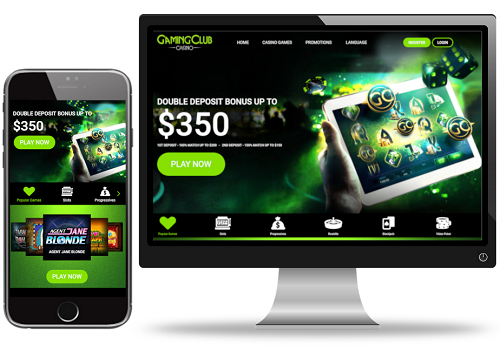 Gaming Club NZ has a NZD$350 welcome bonus for players that join the gambling site. The bonus is distributed into the first two match deposits that players make when they fund their casino account. 1st Deposit – 100% match bonus of up to NZ$200. 2nd Deposit – 150% match bonus of up to NZD$150. The Gaming Club Loyalty Program is also worth mentioning, as Kiwi players earn points with every wager that can be swapped for extra casino credits at a later stage. The most important condition attached to the bonus is that both deposits need to be made in the first seven days after completing the registration procedure. The terms and conditions page on the casino website clearly states this and other clauses of accessing the bonus. Players should take the time to read the fine print before they sign up. There’s also a wide range of table and card games for players that want games, where they can, to employ strategies to win. There’s a long list of table games that players can take part in, whether it is singles and multi-table tournaments. Before players reach out to the customer support team, they need to ensure that their query is not answered already. A list of Frequently Asked Questions has been compiled into a page for your convenience. Alternatively, there’s a team of professionals on standby 24/7 to handle your query. Kiwi players can reach out via live chat or toll-free telephone line. For a more comprehensive query, players can get in touch through the contact form. With players from across the world playing at Gaming Club, there is more than one currency accepted. Minimum deposits as well as maximum withdrawals are not specified, therefore, players should use their discretion as well as a suitable option. Gaming Club online casino might not have the most glamorous welcome bonus, but our collective assessment of the casino website shows why its so popular. Kiwi players enjoy the best of Microgaming games at a safe online casino. As all games at Gaming Club are audited by a reputable gaming commission, we feel good recommending it to Kiwi players. We gave Gaming Club a four out of five-star rating.